There are 51.3 million birders in the United States, making it the one of the most popular pastimes in the country, according to the National Audubon Society. 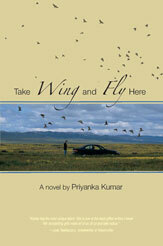 In her new novel, TAKE WING AND FLY HERE, author and filmmaker Priyanka Kumar captures both the intense competition and stark beauty of this world of birding. This is the first installment of Kumar’s New West Trilogy, which explores our changing relationship with the outdoors in the American West.